Crich Parish Council came into being in December 1894. On the 4th. of December a meeting of rate-payers was called under the chairmanship of Mr. Thewlis Johnson J.P.
By a show of hands, the nine candidates from twenty-seven 'valid' nominees who received the most votes were deemed to have been elected. There was however a demand for a 'poll', as a result of which two of the original nine were replaced by Mr.Walter Glossop and the Revd William Acraman. 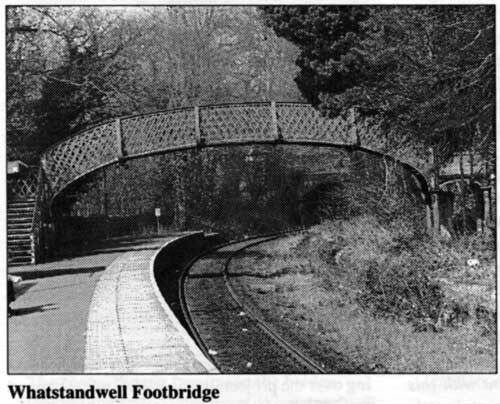 The latter, who had received a paltry twenty-three votes originally (the 'show of hands 'votes cast in favour of the original nine ranged from 133 to 87) has, as we will see, a significant part to play in the story of the Whatstandwell Station Footpath. There must have been complaints among parishioners that the route to the station was circuitous, and more than one shortcut had been the subject of talk and speculation. The problem of bridging the canal and railway was formidable and the acquisition of land on whatever track was proposed, potentially expensive. The Parish Council minutes of the meeting of May 1895 record 'the acceptance of Revd Acraman's offer of four feet of land across his field to provide a footpath to Whatstandwell Station and the best thanks of this Council.., to be given to Mr. Acraman for his generous gift to the Parish'. The land referred to lies on the present track of the path. At the July meeting of the Council a memorandum of Agreement was signed by the donor, the Revd Acraman and the Chairman and Clerk to the Council. At the same meeting it was proposed 'to write to Mr Hurt for formal ratification of his promise to give the necessary land....'. Presumably the reverend gentleman was the tenant of the land not its owner. County Councillor and local landowner Francis Hurt must have accepted the arrangements. In January 1896 Hurt with members of the Parish Council initiated negotiations with the Midland Railway Co. The content of these negotiations is not reported in the Parish council minutes. They were undoubtedly protracted and one might infer less than satisfactory in the light of the fact that, nearly two years later, December 1st. 1897 the Council decided to send 'a petition with reference to the footpath at Whatstandwell.... to the Midland Railway company and a deputation of four councillors wait upon them if necessary'. To add to these difficulties there had been a dramatic turn of events in the Council. The Reverend Acraman attended his last meeting in August 1899. The minutes of Council Meeting March 1900 give the reason for this. Mr. Acraman was no longer qualified to serve on the Council under the terms of Section 46 (c) of the Local Government Act 1894. The Revd Acraman had '...within five years before his election or since his election been convicted either on indictment or summarily of a crime. 'Alternatively he may have been adjudged bankrupt but given that he was still able to employ the services of a solicitor this seems unlikely. It seems incredible that five years since the original 'gift' of land by the Revd Acraman to the parish for the purpose of constructing the Whatstandwell Station Footpath the Council should resolve at the site meeting to instruct the clerk to write to Messrs Eddowes and Son (solicitors) to enquire 'on what terms Mr. W.Acraman will convey to the Parish council sufficient land for the purpose of making a footpath to Whatstandwell Station over his field'. The terms of the letter sent to Messrs Eddowes along with a plan of the proposed path indicate that ' ...the proposed path to the Railway Station would 'enhance the value of the property, the Council suggests that the land be given to the Parish Council or placed on very good terms of payment'. Had the Council forgotten.the original gift? Did the Council assume that when Mr. Acraman was obliged to leave the Council his offer of land went with him? Given that Francis Hurt had been involved in earlier discussion about the proposed footpath, it is surprising that the ownership of the land had not been called into question. According to Derek Wain, biographer of the Hurt Family, maps in his possession leave no doubt that the land in question belonged to the Hurt family. At subsequent meetings the ownership of the land was established and the final rounds of negotiations involving both the owner, Francis Hurt and tenants were concluded satisfactorily with one exception. It would appear from the Council minutes that access to the strip of land which was to become the footpath, presumably from Main Road could only be gained by crossing a small piece of land of which a Mr. Mountrey, Derwent Head, Whatstandwell was tenant, Francis Hurt being the owner Evidently after accepting an offer of £2.00 for the land Mr. Mountrey reconsidered the offer and informed the Council ‘I intend to hold on to the land (for the proposed footpath) as long as I can as it is detrimental to by business.' This turned out to be little over a year. The Council after discussions with the owner of the land resolved to give Mr. Mountrey. ‘12 months notice to give up the occupation of land at Whatstandwell required for the proposed footpath on the 25th, March 1904.' No less than a compulsory purchase order has been served. By August 1902 the project had gathered a fair head of steam. Architects were working on the design of the paths and bridges. The Midland Railway Company were now actively engaged in discussions with the architects on matters of design and the materials from which the bridge would be constructed. A meeting held in the Coffee Rooms, Whatstandwell on the 20th. August was attended by all the members of the Parish Council and the architects. 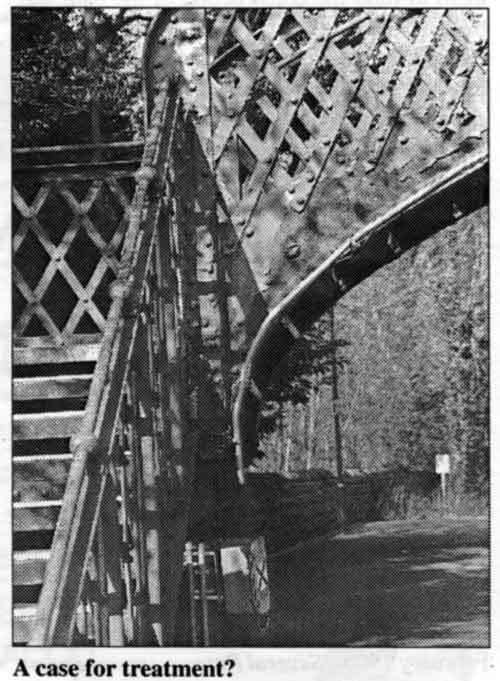 The outcomes of discussions between the Midland Railway Company engineer and the architects were reported including the suggestion that a curved bridge over the canal (be constructed,) to give more headroom between the water and bridge, also an angle in the staircase from bridge to platform. At the same meeting the council unanimously resolved that the bridge be constructed entirely from iron. It was now evident that the original estimate of £250 for the enterprise would not cover the increased costs of these new proposals. Permission to raise sufficient funds for the construction of the footpath and bridges would now need to be sought and consideration given as to how the money would be obtained. Presumably confident that such permission would be given, estimates for the ironwork were sought from amongst others, the Phoenix Foundry Company and the Butterley Company. Finally, formal agreement was secured between the Council and the Midland Railway Co and 'steps were taken for the conveyance of Mr. Hurt's land'. The conveyance was signed in January 1903. The date of this entry in the Parish Council minutes is puzzling in the light of the fact that reference to the Belper Rural District Council minutes of their meeting held in February 1902, it is recorded that agreement had been secured between the RDC and Hurt, Monteagle and the Midland Railway Company to acquire the necessary lands and permission to use the lands ‘for public use'. 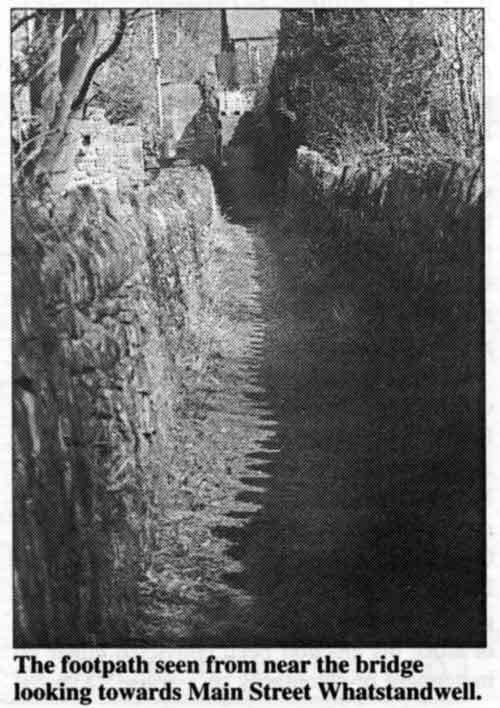 Furthermore, they added significantly, ‘This Council agree to make such road at their expense and further agree that such road viz, a footpath from Crich Carr to Whatstandwell Station shall become on completion a highway maintained and repaired by the inhabitants at large within the district of this Authority'. BRDC meeting of May 1902 when the Council resolved that 'inasmuch as Crich Parish Council have hitherto undertaken all proceedings in connection with the above, they be deputed to act as Agents for this council, with the proviso that all contracts entered into. ..be in the name of BRDC and by them confirmed'. The next reference to the Whatstandwell footpath in the Parish Council Minutes is dated February 1905. 'Several Ratepayers were present on behalf of the Whatstandwell Footpath Promoters and took part in discussions on the subject, but no resolution was made on account of the petition not having been sent in. The matter is to be more fully gone into at the next meeting.' Evidently the natives were becoming restless and organised. Unfortunately, having been fobbed off on a technicality the Council was not true to its promise. According to the record of the minutes of the next meeting the matter was not discussed. If this is the case the project must have been completed before 1907. The sources of information from which this account has been constructed, the minutes of Crich Parish Council, and Belper Rural District Council, do not state when or by whom the path and foot bridge were constructed. Unfortunately the BRDC minutes for the critical period are missing from the Derbyshire Records Office. However, the author, Bill Hudson in his wonderfully detailed book "Through Limestone Hills” provides confirmation of parts of the story and a fitting conclusion to it. He writes; 'In December 1897 The Traffic Committee (of the Midland Railway) received a letter from Crich Parish council and a petition from the residents of Crich Carr..... requesting the company to provide a footbridge over the canal..... On the engineer 's recommendation the request was declined, but Derbyshire folk are not dissuaded easily and the matter was taken up by the more powerful Belper R.D. C. who themselves agreed to build and maintain the footpath. This time the request was not ignored and the construction of the footbridge to link directly with the station was agreed on August 8th. 1901, The work was carried out shortly afterwards with the Midland Railway erecting the bridge itself'. My story ends with a plea, to Rail-track or whomsoever it might concern to inspect the footbridge and undertake those measures necessary to conserve this splendid example of Victorian architecture. Thewlis Johnson J.P. who was chair of the first Crich Parish Council was the "Nephew" in "Johnson & Nephew" Wireworks at Ambergate. Mr Mountney who held the parish to ransom over a strip of land was the landlord at the Derwent Hotel (also known as the Bull's Head). Fascinating that Revd Acraman had handed over tenancy of the 'gifted' land to Revd W. A. Monteagle who then reneged over the arrangment and held up the construction of the bridge. They were one and the same gentleman! After Acraman came out of Derby gaol he moved to the south coast where he changed his name by deed poll to Monteagle. He claimed it was a family name stretching back to one of the Gunpowder plot conspirators – the one who turned evidence against his co-plotters and was spared their fate.